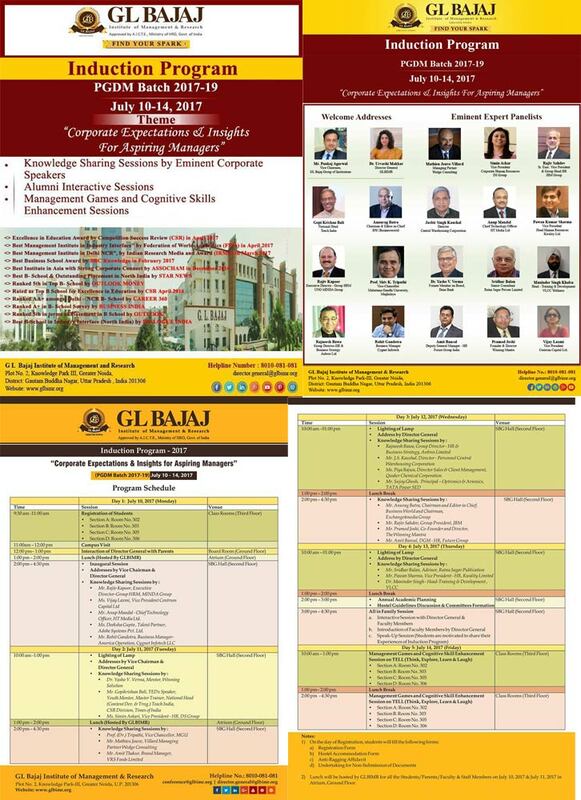 It gives us immense pleasure to share that G L Bajaj Institute of Management & Research, Greater Noida (GLBIMR), is organizing The Induction Program – 2017 for the newly admitted PGDM Batch 2017-19 on “Corporate Expectations and Insights for Aspiring Managers” from July 10-14, 2017. The Induction Program aims to provide direction to the young minds and enlighten them about how to focus their energies during the PGDM program so as to get maximum benefit out of the program. The main objective of this program is to sensitize the young budding managers with the pragmatic experiences of the corporate world and its expectations from them in the challenging and changing Global scenario. There will be Corporate Expert Knowledge Sharing Sessions each day where, 3-4 panelists in each session will be sharing their views on the theme, “Corporate Expectations and Insights for Aspiring Managers”.